Long before the first major civilization in Mexico, chocolate was being drunk in Puerto Escondido, Honduras. Centuries later, this delicious bean was consumed all over Mesoamerica and was eventually introduced to Europe through the famous Spanish conquistador, Hernan Cortes in the 16th century. 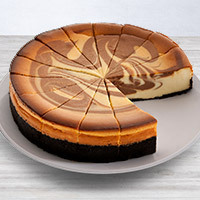 It was so delicious, that it quickly became popular, but was so expensive that only royalty could get their hands on it. Nowadays, chocolate isn't that hard to come by, but really good, mouthwatering chocolate is certainly a rarity. 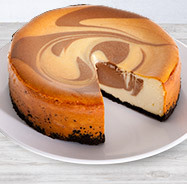 Our Chocolate Swirl Cheesecakes are made with only the best chocolate, perfectly hand-swirled into our creamy cheesecake. We did the ancients proud.